I think when we set out on this journey I described this style of travel as knowing where you want to go but having little idea of what lies ahead. So our disappointment at missing the last bus to Krabi for the day is short lived. We go looking for a hotel and spot along the way a Pizza Hut. Make a mental note of its location before discovering the My Place Hotel. Inspect a decent room for 550 THB with air-conditioning, no need to look elsewhere this is indeed my place. Return to the Pizza Hut passing a night market along the way with no desires to sample local cuisine… at least not tonight anyway. I suppose upon returning home I will ignore fast food offerings and opt for Thai cuisine just to complete the irony. The next morning and we are trying to purchase tickets to Krabi with mixed results. Prices vary from 150-300 THB. One gentlemen after asking where we are from informs me his son is studying in Monash University. A prestigious college, he must be very proud I say. Yes but the fees are very expensive he replies. He sells us two tickets for 150 THB each and we board a fairly decent looking bus across the road. The journey time to Krabi is as varied as the prices offered so I expect the lower priced tickets to produce a longer journey time. Four and half hours later I am proven correct. We stop at the main station where all the locals on the bus depart. We go to get off but the driver with limited English motions for us to wait as he will let us off at another stop. 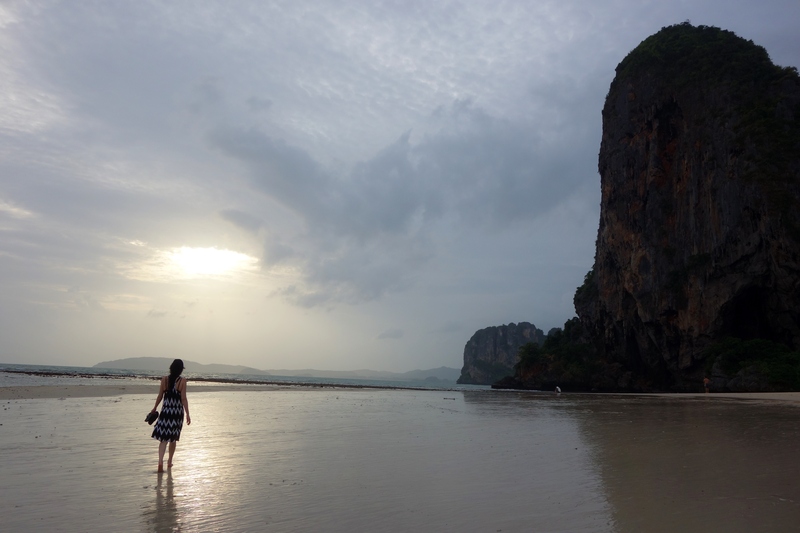 Ao Nang, I ask now breaking the rule of travel that… thou shall never ask a question where yes can be provided…Yes he says. Ten minutes later we pull up at a deserted station where conveniently a lone truck sits waiting. We are not at Ao Nang. With us is Ryan a young man from South Africa who is teaching English in Surat Thani. The truck driver asleep in the front seat stirs like a crocodile on the river bank and gets out of the truck. He agrees to take us to Ao Nang about ten minutes away for 100 THB each. A very steep price for such a short journey but there is nowhere else to go and we accept the offer. Arrive at Ao Nang hoping to see calm blue and inviting waters but are greeted instead by brown waves and dangerous rips. I had hoped that the rainy season was restricted to occasional heavy downpours but it seems the prevailing winds and currents make the ocean almost un-swimmable regardless of whether it’s raining or not. 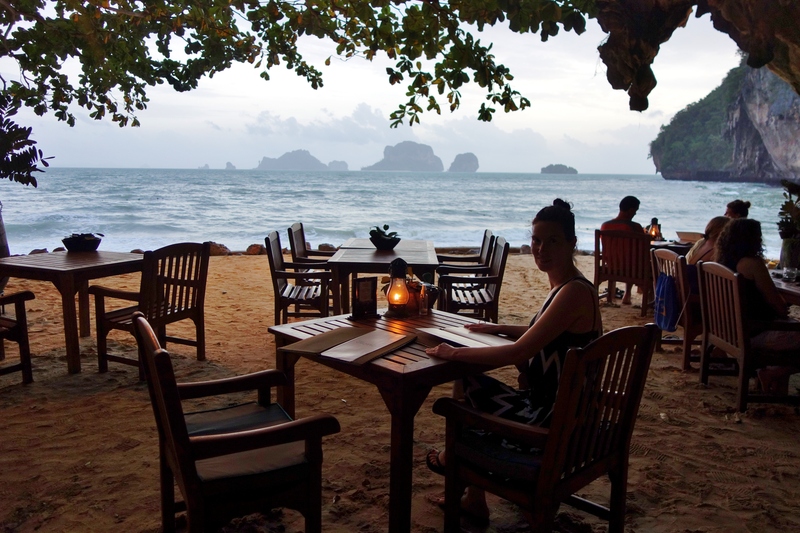 We stay for a few nights around a cove at Railay beach which can only be accessed by boat. On this occasion a frightening experience of rolling waves and soaked luggage. Our entrance onto the beach must be timed to perfection should we be tipped over in the surf. The driver executes a precision landing with steely expression and years of experience. Hop over the side with pants rolled up and manage to cut my foot on a rock wedged in the sand. Ryan sporting massive biceps helps with our luggage and runs up the beach before the next wave comes crashing down. He hops back on the boat and makes for the next cove about five minutes away. Yet another act of kindness on a very long list. 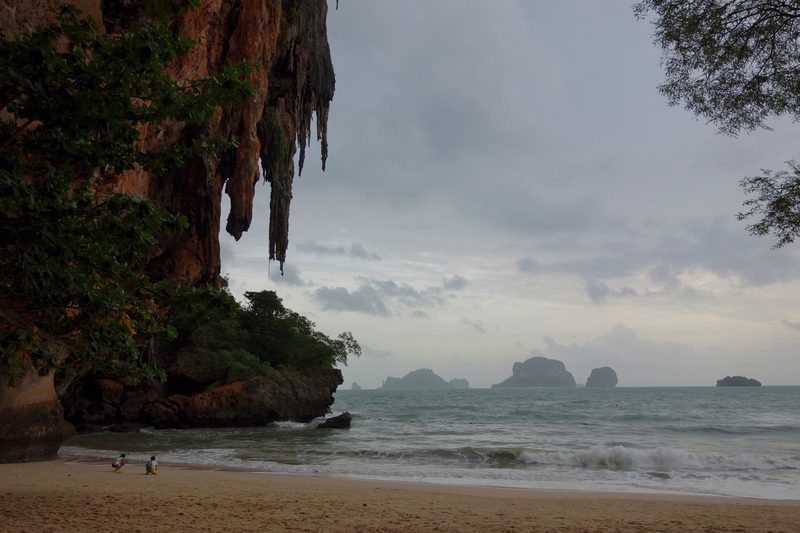 I gaze around and despite the inclement conditions the splendour of Railay prevails. Soaring cliffs and jagged islands erupt from the ocean. The palm trees bending over in stiff winds. It’s not ideal but still very beautiful. Later that night after finding cheap lodgings we spend our savings on several expensive but incredibly well located cocktails. The grotto bar at the Rayavadee offers an experience of Robinson Crusoe meets martinis and mood music. Cast away chic with inebriation. Three days later and the driving wind and rain have literally dampened our resolve and there are only so many lychee martinis one can consume. Well actually budget is governing that figure more than constitution. With some regret we abandon ship and head back to Surat Thani. 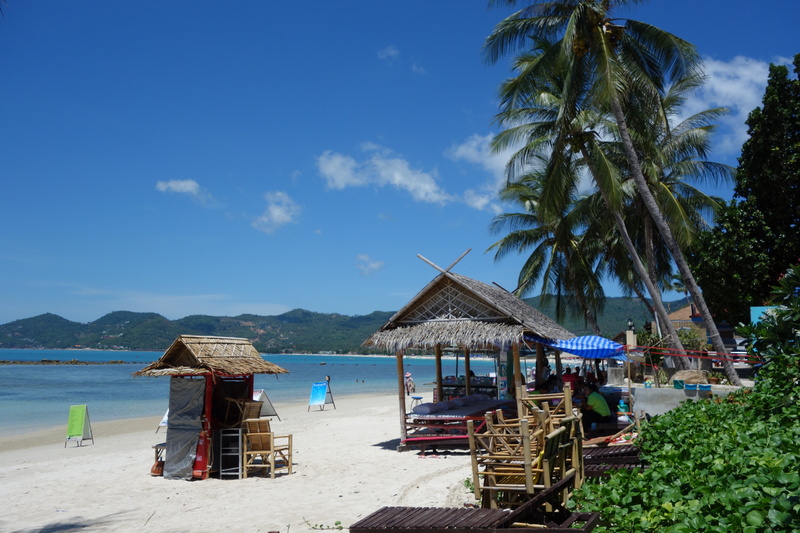 While weather is at its worst on the west coast of the Thai peninsula, reports indicate that Koh Samui in the Gulf of Thailand on the east coast are currently ideal. We book a prepaid ticket from Railay to Koh Samui for 750 THB or around $26.00 USD. This includes a boat back to Ao Nang, a transfer to Krabi, followed by a bus to Surat Thani and finally a high speed ferry to Koh Samui. I try to price it up separately but it adds up to be more and that’s provided we don’t run into any problems, which of course one must expect. The journey across the peninsula goes smoothly and with no real issues we reach the island of Koh Samui in about 6 hours. Koh Samui is not nearly as beautiful as Railay but under blue skies and washed by calm waters is certainly more appealing at this time of year. The choice of locations and accommodations are almost endless as are the bars and restaurants along Chaweng beach. I can’t say I would ever deliberately come here on a holiday but it makes for an excellent place to eat, drink and reflect before we make our final push to Singapore. We hire a small motorbike for a few days and explore the rest of the island. Disappointingly most of the views along the road are blocked by buildings and resorts. It also appears to be a very dangerous place to ride a bike as we witness three very bad accidents involving foreigners in as many days. It’s a sobering experience to ride carefully and to assume every vehicle around you is a potential killer. 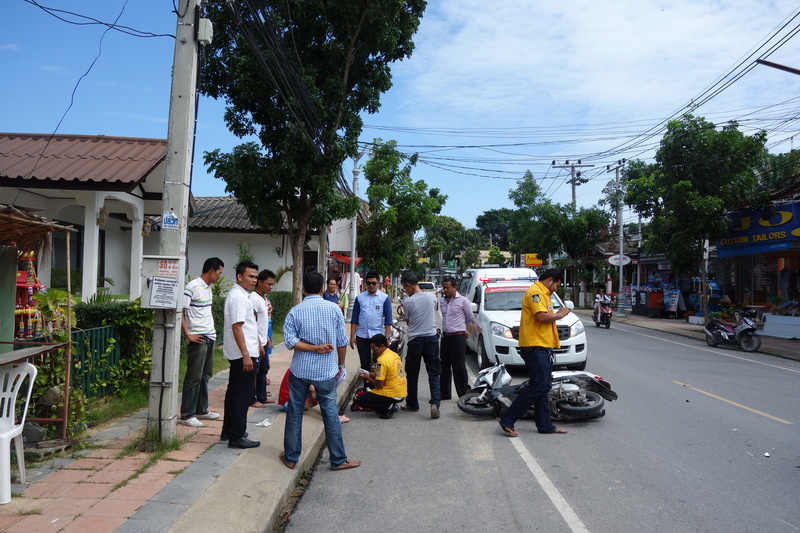 The third accident is particularly nasty involving a young Russian tourist. His head has been badly cut and the front of the van he collided with looks like it has been hit by a wrecking ball. After so many months on the road I really don’t want this to be our fate so we return the bike to its owner. At best it’s supposed to take one and a half days to reach Singapore from Koh Samui so we allow three days just to be safe. It seems a reasonable margin for error while allowing some degree of risk and adventure. What remains uncertain is will we be able to get train tickets from Hat Yai to Kuala Lumpur later in the day. The first ferry departs at 8.00am and transfers to a Mini Van that will take us five hours south to Hat Yai. The expected arrival time is 3pm. The overnight train to KL departs at 4pm so there isn’t much in it. The day starts poorly and we are not picked up until 7.30am. Now with slight panic we head to the pier wondering if we have failed to make the ferry let alone the train in Hat Yai. Arrive at the pier late but the ferry has not arrived yet and ends up departing not until 9.15am. Will this mean getting into Hat Yai too late for the train? The driver of the van must be telepathic and responds accordingly. His speed is a little unnerving but not frightening and I am just grateful that based on distance and glances to the speedometer we seem to be back on track. 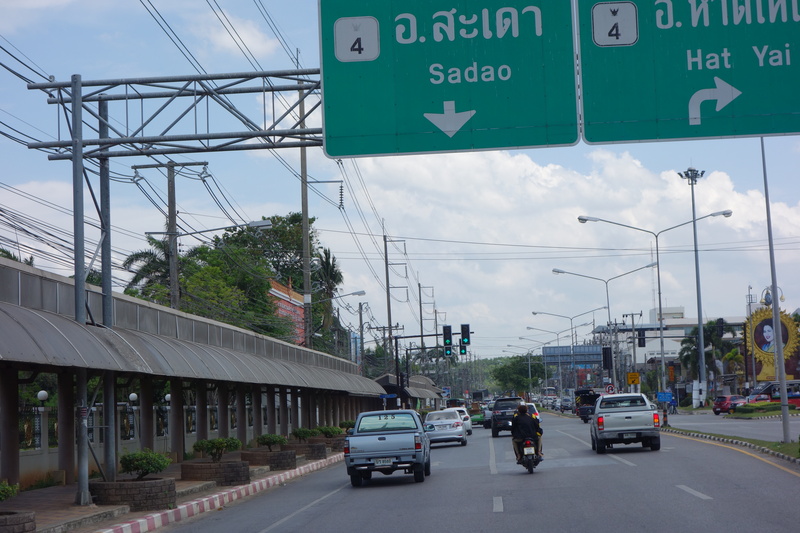 Arrive into Hat Yai at 2.30pm but the driver does not want to stop at the train station and instead drops a young lady outside the university before continuing to the bus station. Feeling a little frantic we go in search of a taxi, tuk-tuk or tout but none to be found. Punishment no doubt for all my cursing’s along the way. Make some form of mumbled penance and get rewarded by a tout who leads us onto the street. A man with a beige car will drive us to the train station for 150 THB. Seems a good offer considering our surrounds and imminent departure of train for which we have no tickets and it smells new inside. Not a fragrance I can remember for some time. When we get out at the station I thank the driver and watch the beige car disappear into the traffic. That was certainly never scripted. My anxiety regarding space on the train is somewhat justified. There are no sleeping berths available for tonight’s service nor are there any seats available in 1st class. She can provide two 2nd class seats for the 14 hour trip down to Kuala Lumpur. We engage in a quick meeting and decide that 2nd class train is still better than the bus although others might disagree as the bus is quicker by three hours but I don’t see the point of arriving at 3.30am. Platform four is underutilised by a short train of just two carriages. The rains have cleared and the afternoon sun has dipped low enough in the sky that the roof of the platform no longer provides ample shade. The doors are still locked despite a planned departure in thirty minutes. I look longingly into the carriage, streams of air-conditioned condensation running down the window. Decide to pass the time by looking for a money exchanger. Swap Thai baht for Malaysian Ringgit, my penultimate currency. If all goes to plan I shall require it for only 20 hours and I begin to wonder why I am bothering but it’s such a hard habit to break. Return to the train to find the doors have been opened and take my place in the soothing air-conditioned comfort with a plastic bag filled with mangoes and cut pineapple. The train departs on time and we head for the border at a slow and considered speed. Nothing remarkable outside to look at we arrive about an hour later at a very modern station. 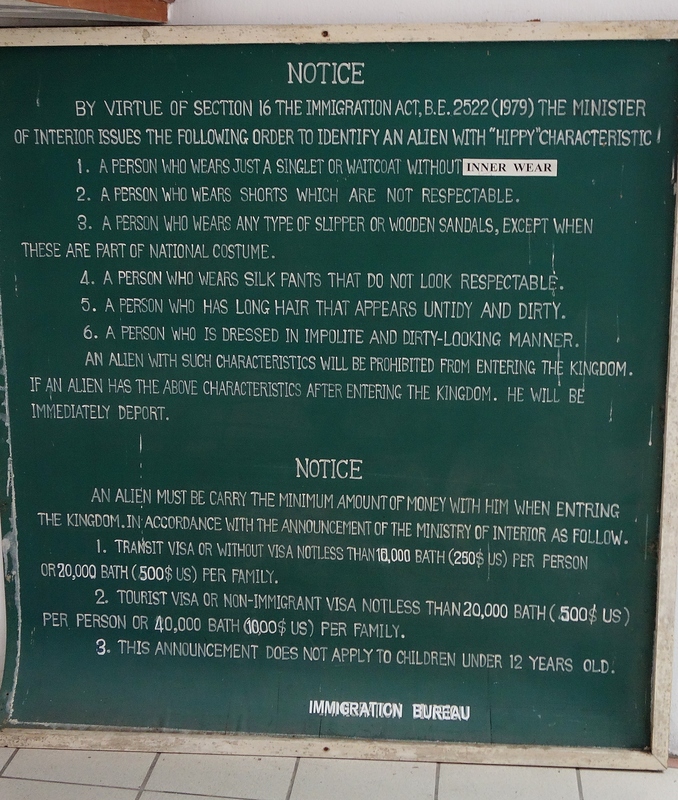 We exit Thai Immigration and notice a sign that warns that aliens of a Hippy nature will not be allowed to enter. The board then explains in great detail what exactly constitutes said Hippy Alien. Long scruffy hair, wearing ragged clothes and the unnecessary use of sandals are all deemed valid reasons for rejection. I can’t say based on our experiences that this policy is ever greatly enforced but hippies beware. Or are they trying to prevent some E.T looking character with dreadlocks entering. The ladies at the Malaysian counter are wearing head scarfs. It’s been so long since we were in an Islamic country I had almost forgotten about Malaysia. We are given an entry stamp and allowed back on the train which I notice is considerably longer in length. I go to the ticket counter and ask if I can upgrade our tickets to sleeper class. Seems now we are in Malaysia with added carriages this is not an issue. Bit of a relief as I was not looking forward to a bad night’s sleep in a chair. The train pulls out of the station as the sun sets. This seems to be a common theme of late. If it runs on time we will arrive at 6.30am and hopefully be able to secure seats on the 8.30am to Singapore. I go to sleep on a train crawling its way south during the night to Kuala Lumpur. I wake the next morning but it’s still dark outside. The conductor tells us we will arrive into KL central in 10 minutes. He tells me the time is 6.30am. This is good news we are still on schedule. We arrive into an underground station which is a little bleak and disorientating. Upstairs resembles more the inside of an airport terminal perhaps an early preparation. The ticket office is yet to open so we sit on some steel chairs looking and feeling a little discarded in the huge empty hall. I go out onto the streets of KL. Dawn is coming and some of the street lights begin to turn off. There is nothing to suggest where I am. I could be anywhere really. It’s been a few weeks since we have experienced life on the rails. The Bangkok Express lumbers rowdily along tracks less smooth than those we experienced back in China. 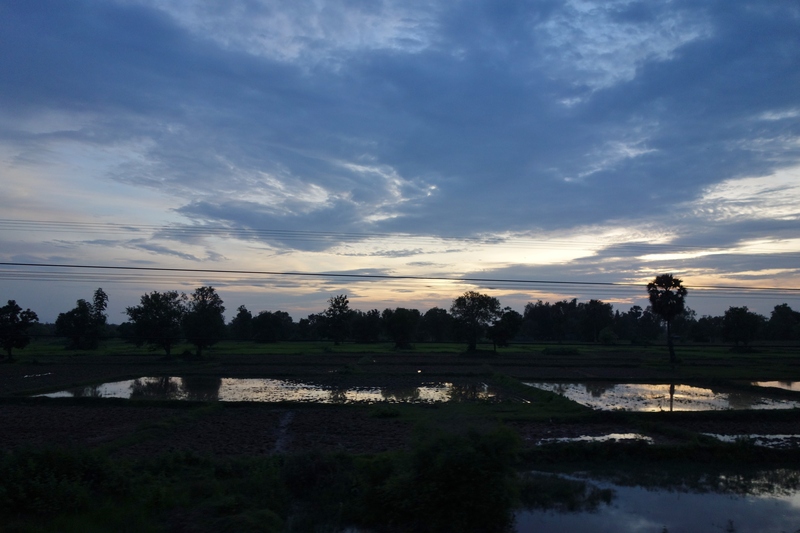 I pass an open door on the way to the bathroom affording irresistible views of the rice paddies now gleaming under a Thai sunset. I stand by the open door taking in the fragrance of the jungle transfixed as the sun slips slowly below the tree line. The passing of each day is beautiful but more so in recent weeks I am also left with feelings of melancholy. The last of the sun is extinguished and the spell lifts. I return to my seat which is now being converted into a bed by an enthusiastic and high-spirited conductor. He is a good natured man and while tucking in sheets explains the dinner choices on the menu. I order the set 2 option which consists of red chicken curry and some steamed rice with vegetables. The beds in 2nd class are not contained within a private compartment but they are extremely wide and could almost accommodate two people. My only complaint being that the main lights in the carriage are never darkened during the night and the pale blue curtains do a terrible job of blocking it out. But more so I am just grateful to have a bed to sleep in. 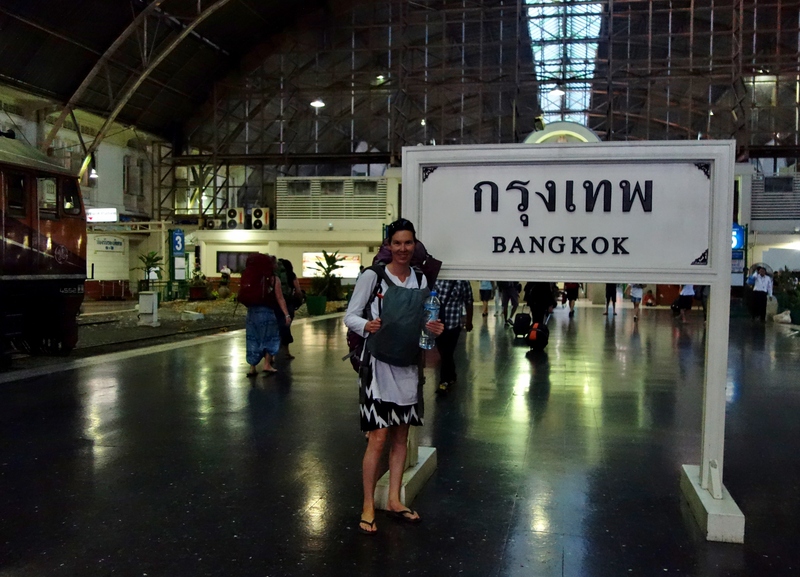 Our train makes steady progress during the night and we arrive into Bangkok just before sunrise at 6.30am. Despite being the final stop the conductor is keen for us to vacate the beds so he can pack the sheets and convert them back into seats. I try to extend my stay in the bed with desperate and tired looks but he is having none of it and claps his hands with a smile to hurry me up. I exit another train and step onto the platform of yet another city. The ground beneath my feet feels a little unsteady as I walk towards a sign that says Bangkok. Despite feelings of tiredness we wait in line to purchase tickets for the next leg of our journey. I ask a man for two sleeping berths to Surat Thani. He seems a little surprised by my request and casts me a doubtful look before searching. I can see already by his expression that the news is not good. There are no seats available for several days; it would seem we have stumbled into Thailand during summer holidays. I ask him to check the morning train which is notably slower than the evening express trains. He finds two seats but it doesn’t leave until two days later. We could try for a bus but I feel a longing for the romance of trains and a weariness for buses. We book two tickets on the day time train which at least has the bonus of allowing the scenery outside to be observed, even if it is at a greatly reduced speed. 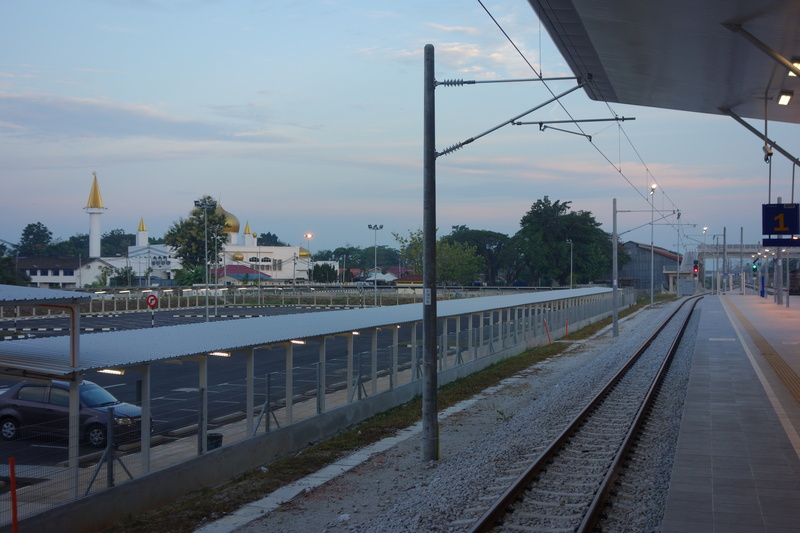 We then try to book onward travel south into Malaysia but advance bookings can only be made in Hat Yai from where the train departs. This is an issue as we won’t be in Hat Yai until the day of departure so securing a reservation might be difficult. And there I was thinking that things were becoming too easy. The disappointment is fleeting and washed away by positive thoughts. I think the philosophies preached to me by the station master in India are finally sinking in but do they extend to the Thai Rail network. I feel a consultation is in order. I want to ask him for emergency quota or tourist quota but those days are now many months behind us. There is nothing more we can do for now and that is comforting in a small way. I oddly begin to feel that some adventure has crept back in and I am almost a little happy by the uncertainty of it all. The normally busy streets of Bangkok are empty and still in the early morning light. A city still sleeping after a busy night. It looks lethargic and unwilling to wake up which I can currently relate to. It’s a place renowned for its smiling people, glittering temples and garish girly bars. 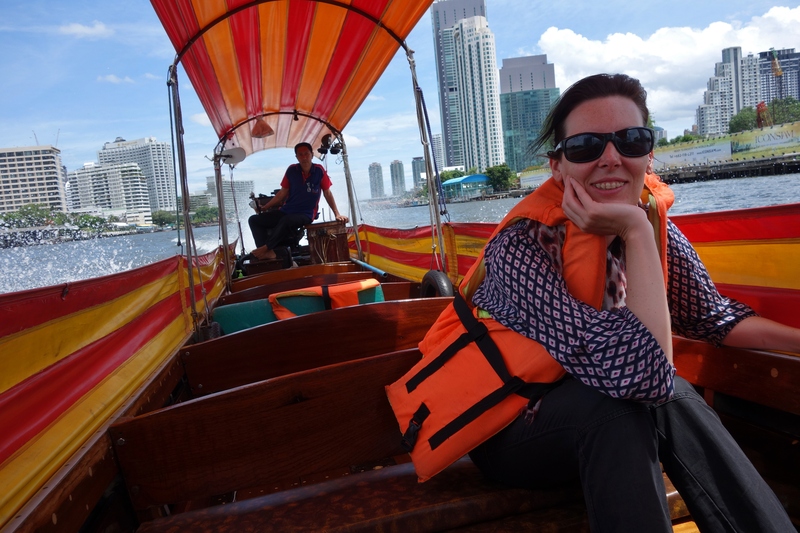 I remember back to a time when Bangkok was the most exotic city I had ever visited. But Bangkok once so far removed now seems an oddly familiar place. Women walk to work in designer outfits. Packs of teens take selfies and giggle on their way to school. Buildings are tall and sparkling. The streets look clean. Has Bangkok changed or have I? We arrive at the Four Seasons hotel looking ragged and very much out of place. The staff also seem surprised and unsure about offering assistance. I don’t think they are used to seeing clients arrive with luggage strapped to their backs. I am feeling very tired but we are just in time for a buffet breakfast. This has become a recent treat while travelling; an all you can eat extravaganza that lasts for hours should you want it to. I see a boy aged around 11 at a table nearby. I notice he has taken a huge chunk of camembert cheese; in fact he has taken the entire block from the cheese counter. I stare at him with distain as he pushes the cheese around his plate with no intention of eating it. I look at his parents, both of whom haven’t even noticed as they’re so engrossed with their smart phones. As we’re leaving his mother has taken her attention momentarily away from her cyber life but only to ask the waitress to clear the plates. The lump of untouched cheese is taken away. I shake my head as I walk past thinking of the many children who might have appreciated just a small slice. With little time remaining we make use of the fast access to internet and commit to booking flights from Singapore back to Australia. The thought of flying feels treacherous. For almost one and a half years I have noticed thin white streaks passing high above me in a blue sky. I always considered them the enemy in some way. A representation of modernity and fast paced life not linked to our world of buses and rickshaws. It seems incomprehensible to me that we are planning our final days on a journey that stared so long ago. I feel as though any movement forward is killing me and the trip. The trip has become an entity in my mind, the memories make it whole and I don’t want to let it go. For so long we have been going forward with purpose and commitment on our journey, now ironically I feel am being carried unwilling to an end I no longer want. We scan the internet for the best possible deals around a date that allows us sufficient time to reach Singapore. The traditional carriers are all very expensive but we find a reasonable fare with the budget carrier Scoot airlines. They offer such luxuries as in-flight meals, entertainment systems and extra leg room at an extra cost. But none of these seem relevant at this point in time so we purchase two tickets at the lowest possible price. With the push of a button we have now for the first time a line in the sand, a date that we must finish on. I feel like I am on some sort of travel death row. I know it all sounds terribly morbid and negative but there it is. We try to turn things around by focusing on where we are and making the most of the time we have left. 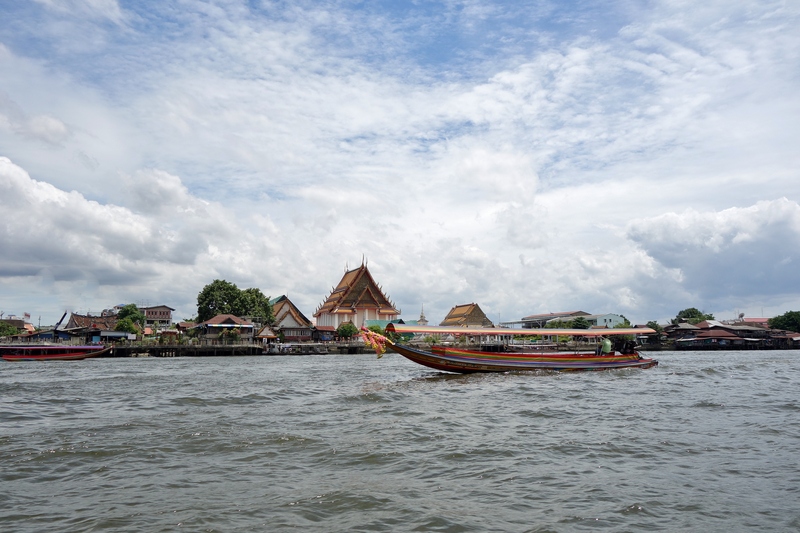 We head for the river and catch a high speed long tail boat up to the Grand Palace. Apparently the public boat is not due for 90 minutes. It seems unlikely but I need a rush and some instant gratification. Our boat driver seems to understand and obliges with death defying speed on the water. We arrive at the pier a man tells us there is a 30 THB or about $1USD landing fee. He even has tickets as proof. I ask him to come to the office with me but suddenly he moves on to the next tourist. Apparently sceptics need not pay landing fees. 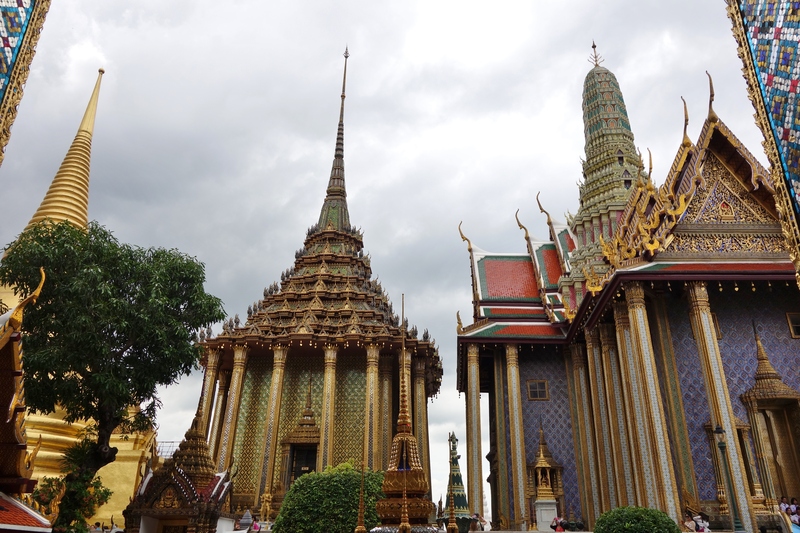 The Grand Palace is by no means an exaggeration. A striking collection of buildings and temples adorned with golden tiles and colourful glass mosaics. Tourists pay $15.00 while Thais are admitted for free. At least in India they deemed the local population partly responsible for the upkeep of their own treasures but here in Bangkok the burden is exclusively shouldered by foreigners. I don’t blame them in some ways as I don’t think the Thai’s hold the behaviour of western tourists in high esteem. They wander the temples wearing clothes provided at the entrance as most have arrived inappropriately dressed. The distance to Wat Pho is short however the late afternoon sun makes for a difficult walk. The road side vendors selling water and orange juice are greatly appreciated. The entrance to the temple is only 100 THB or around $3.00 USD…Thai’s are still admitted for free but it doesn’t matter despite the fleeting irritations, I love the inconsistencies of Asia. 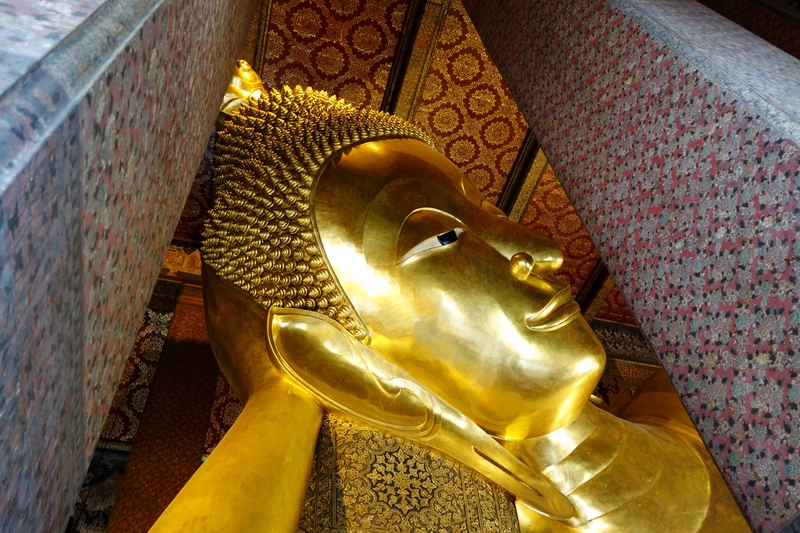 The Wat Pho temple houses an immense reclining Buddha that stretches the better part of an Olympic sized swimming pool. His huge face smiling down on mere mortals below almost looks appreciative to be out of the blistering sun. My mind wonders back to the Bodhi tree in Bodhgaya India where he originally sat gaining enlightenment 2500 years ago. I contemplate the power of ideas and how the teachings of the Buddha have reached across all the lands we have traversed to get here but in an ancient world before trains and buses existed. Small metal leaves hanging from the eaves of the building begin to tinkle. To the west is a bank of grey cloud. It billows thousands of meters into the air like a vast volcanic eruption. The brass leaves rustle metallic in a cooling breeze. The sound and the smell of the approaching storm is refreshing. A few drops of heavy rain strike my face. We take refuge in a building nearby which conveniently offers massages for 450 THB or around $15.00 USD. The rain is now coming down hard so we decide to take stay and pass the time with a traditional Thai massage. Actually we probably would have had one even if it were not raining but the weather outside helps remove any fiscal guilt. I ask for a firm massage demonstrating hard gestures. She calls for a stern faced replacement who looks like she enjoys administrating pain. Small in stature she has learned over the years how to harness the forces of gravity with excruciating results. A combination of pride and ego prevent screams from escaping but eventually I yield to her tortures. She seems pleased and smiles. The storm has helped reduce the temperature outside but the humidity has increased as compensation. I guess any change is appreciated. We will be returning soon to winter in Australia so any complaints are quickly dispatched. It’s time to play our favourite game of guess the Rickshaw price back home. 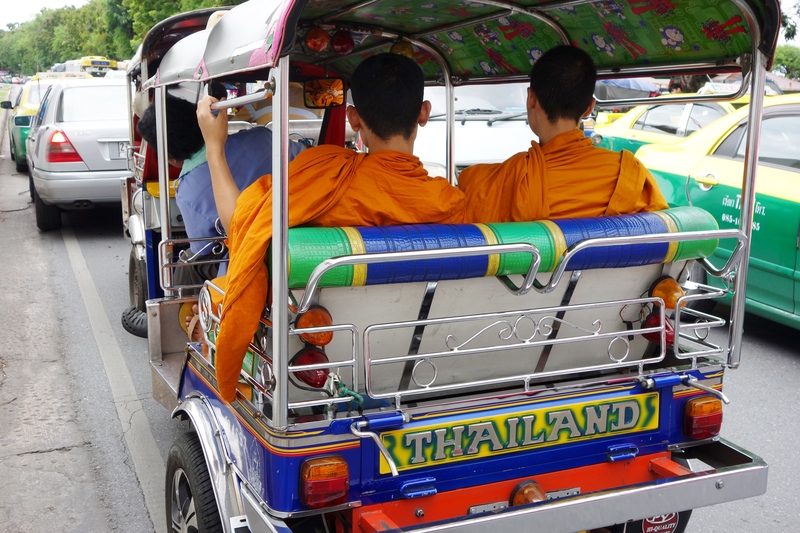 The rickshaws in Bangkok and particularly those tethered to the Grand Palace are some of the sleekest found anywhere in Asia. More streamlined and high powered than any we encountered in India and Africa. Their owners obviously have taken great pride and it shows. Fluorescent upholstery, low profile wheels, colourful lights and booming sound systems dazzle prospective clients. I think it is the only place in the world where a Tuk Tuk commands a higher fee than a taxi, but looking at the machines I can understand why. We strike a deal for 300 THB the original asking the price starting at 500 THB back to Siam square. The sound of the engine is in accordance with the style of the Tuk Tuk. Deep growls released through chrome exhausts power us around and through seemingly impossible holes in the traffic. 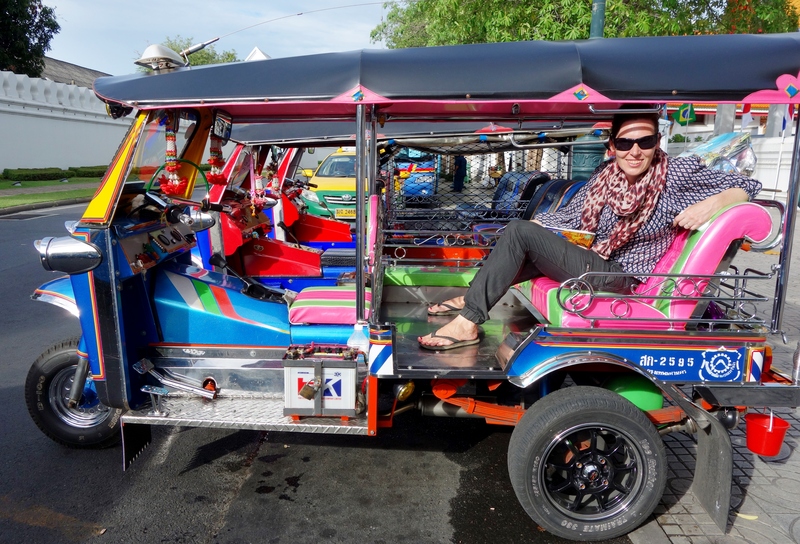 It’s an exciting ride and almost an essential experience with any trip to Bangkok. The following morning and we are headed back to Bangkok station. It’s early and for obvious reasons I get a feeling of déjà vu. Was it only two days ago we arrived. I find time is not behaving in ways I am used to or perhaps more in ways I don’t want. 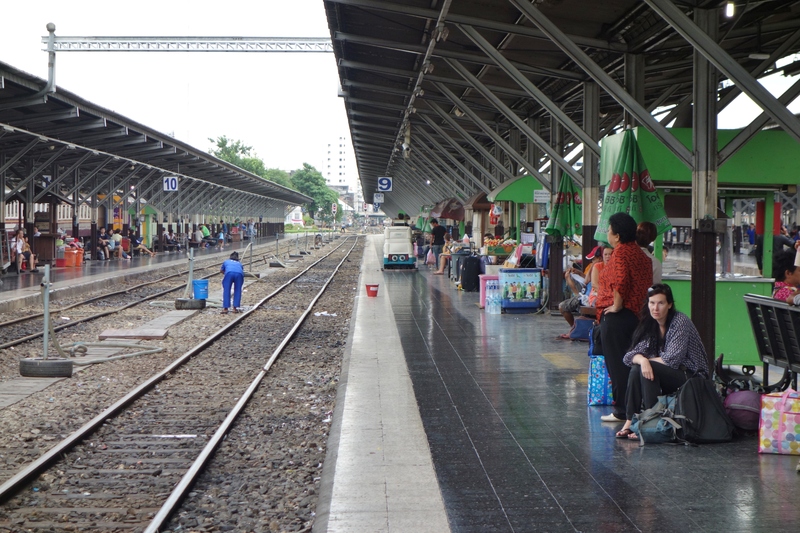 We wait on platform 9 for the 8.20am train to Surat Thani to arrive. Without apologies it finally shows up just before 10am. We were to arrive in Surat at 4.30pm with a chance to reach Krabi 3 hours away an outside possibility but already that seems in doubt. I notice for the first time some signs of the coup that occurred in Thailand a few months ago. There is an increased number of soldiers carrying guns and wandering around the station. But I can’t say aside from the presence of the army that there is any change in behaviour or attitudes. Our train leaves Bangkok just before 10.30am. I don’t expect it can make up time along the way and nor do I want it to as the ride is very rough and terribly un-assuring. 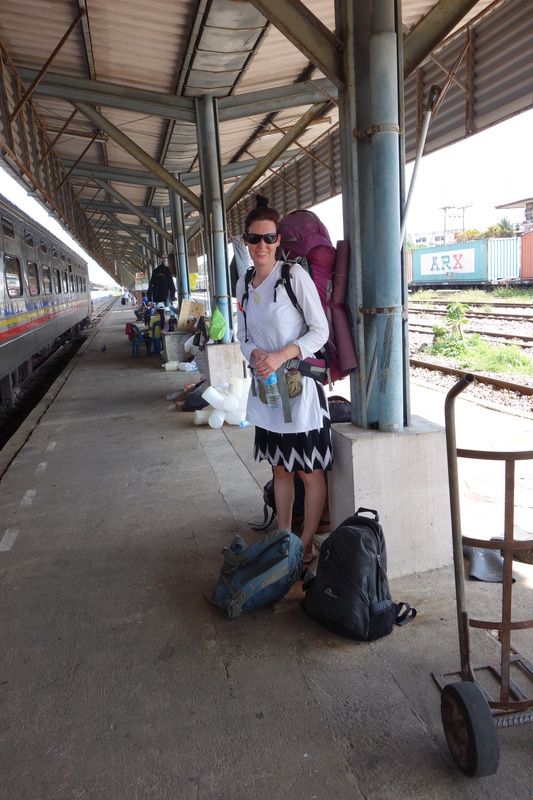 A few hours later we pass through Hui Hin and a few hours after that the rails draw close to the coast and the gulf of Thailand. To our right is a long chain of green mountains that mark the border with Burma. We continue to run south down the Thai peninsula reaching a point that is only 30km wide. Eventually we reach Surat Thani just before 6pm. 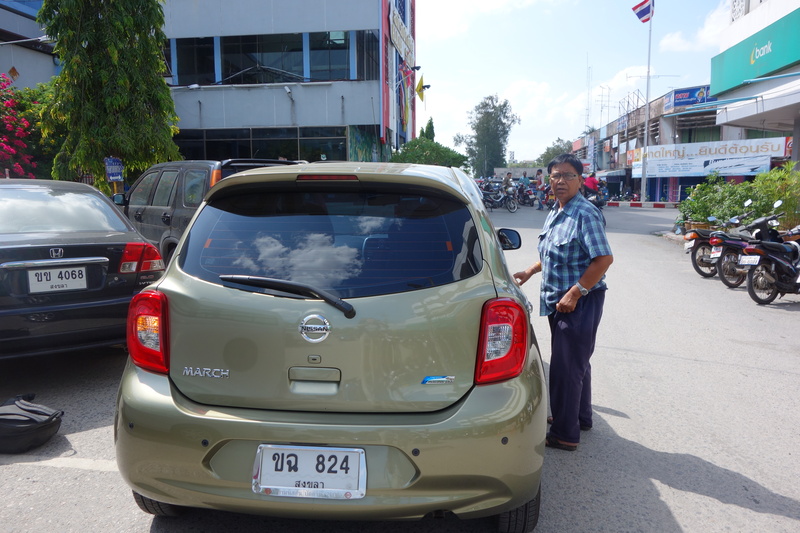 A tout offers to take us 17km into town for 150 THB. He hold up a picture of a Bus with a time underneath indicating a 7pm departure. Maybe we can get to the beaches of Krabi tonight after all. He loads us into the back of a converted Hilux jeep with 3 other tourists from Denmark. The jeep accelerates to frightening speeds and sweeps around bends without concern for physics or its consequences. The Danes are going to Koh Samui and headed for the ferry, 10km later we are transferred with some gratitude to a less menacing Tuk Tuk. 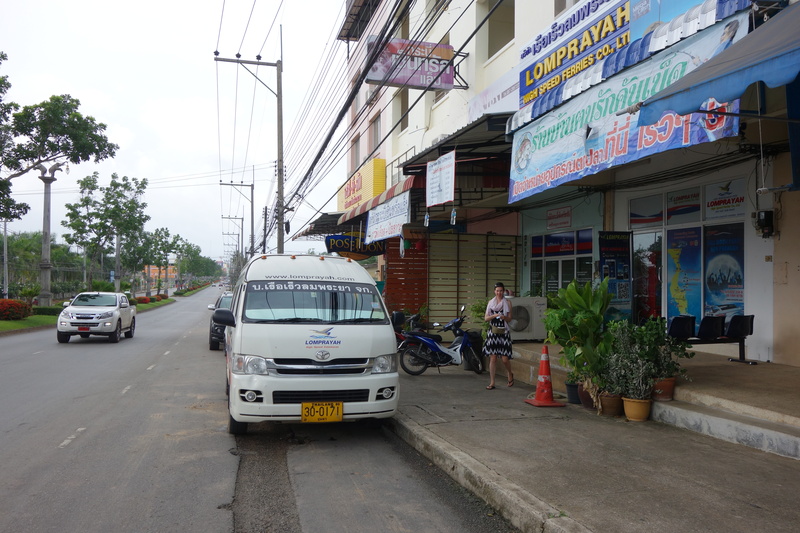 By the time we reach the town centre we are dropped outside a fruit shop that apparently runs a bus to Krabi in the morning for 300 THB per person. I ask to be taken to the actual bus station which is difficult to convey but we eventually get there. The station looks devoid of activity and a little gloomy. There is no 7pm Bus the last one left at 5pm.